[AUTO](VC):When your G unit Stride, choose up to one card from your hand, call it to (RC), choose up to one of each fighter’s rear-guards, and lock them. (The locked card is turned face down, and cannot do anything. It is unlocked and turns face up at end of the owner’s turn.) [AUTO](VC) Generation Break 2 (Active if you have two or more face up G units in total on your (VC) or G zone):[Soul Blast (1)] At the end of your turn, if a locked card was unlocked during that turn due to the effect of your card, you may pay the cost. If you do, draw two cards. Well here’s a nice straight upgrade to the old Alter Ego. Unlike the old one, this doesn’t need to lock one of your own as part of its cost, so crapping on the user’s field won’t slow it down. 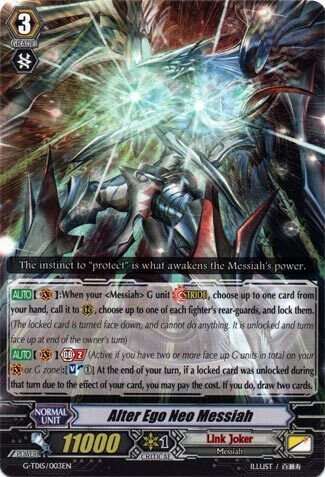 It carries the Altmile clause of being able to superior call and then lock the called card, which to me solves a lot. The GB2 doesn’t draw as often as old Alter Ego, being restricted to your turn, and once per turn, but you get more from each individual soulblast: +2 for each…as long as you unlocked something with a skill that turn, whereas old Alter Ego sprung when anything was unlocked ever. Still, general consensus is that this is better, not costing counterblast and drawing more for less. A costless lock on top of being able to call a useful card from your hand as a lock target if needed? That already sets Neo a peg higher than his original form. Add to this the fact that his Generation Break 2 skill costs only a single Soul for two draws – a cost envied even by the draw-centric clans such as Oracle Think Tank – and you have a very nice card. Finally solves the age of problem of Messiah of not being able to lock cards without locking their own, cause you can now choose up to!!!! WEEEEEEEEEEEEEE. and costless to boot. Finally!